Some of my Genea-Blogging friends are posting their Mayflower descendants in the blogs. Midge Frazel, of Granite in My Blood posted her proven lines today. Our Proven Mayflower Lines. After looking at her names, I had to look at my database, as the names were familiar to me. When I looked at the names, I saw some strange relationships between myself and John Alden, which would mean that I might not have a direct line back to him. Then I realized what the connection is to this Mayflower Ancestor. My Son-In-Law is the descendant of John Alden. This entry was posted on Tuesday, November 22nd, 2011 at 11:35 am and is filed under Family. You can follow any responses to this entry through the RSS 2.0 feed. You can leave a response, or trackback from your own site. The Mayflower lines are very interesting, Russ! Thanks. Where do we go to view the others? Is the font size too small? I may be able to change them. I have just been using the Default size. I haven’t spent a lot of time researching the Mayflower connection too much, but maybe I should. I have to merge this David Ridgely Howard file with my family file. I created a specific file for this Inferential Genealogy project. I want to clean up the Ridgely and Howard lines up a bit before I post them. I do have a Worthington website where I do have some information posted there. I had a little difficulty reading the names on your son-in-law’s Alden line. Don’t know if it was the lovely background interfering, or if the font is a tiny bit small. Thought maybe my eyes were distracted by the trees and colors in the background. The posts on the plain white pages are easy to read, even though the font is small. ????? Thanks so much for the link to the Mayflower lines. I’ve backed up to the first post in your Genealogy file and plan to read your posts forward on your Worthington line. Is there an easy way to get to the first post in each folder without hitting the “previous” key all the way back? I want to read through each of your folders and copy/paste the posts that are interesting into a folder of my own for easy reference, such as all your research tips. Thanks so much! Look forward to seeing your Ridgely and Howard lines. I completely understand, as I like to have everything perfect before I copy anything into a line, too. Thanks for all your work and for sharing with us. This is a very impressive and interesting blog! Thank you for the clarification on the font. That was more or less intentional. 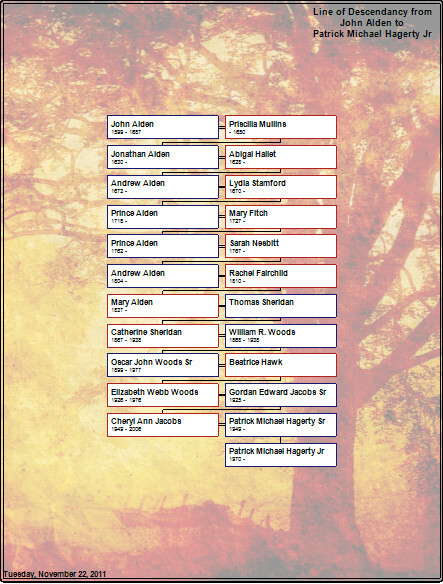 I was just showing of a feature of the program that I use and to show that there is a Mayflower ancestor in my tree. In looking at what I had, I realized that I have a lot of missing information. It also served as a reminder to me to spend some time researching those people. The 3rd Item, on the Left, is the Archives. There is a pull down menu that will take you back to the beginning of the Blog. The “folders”, are you talking about the Tags, or subjects? Like Maryland, Howard, etc? I try to put a tag on each article that will reflect a Surname or Location in the blog post. Very cool ill add it to my list. John alden is mt 11th great uncle. I was excited to see him in my tree.